Go 4x4 and get Off Road for real thrills. 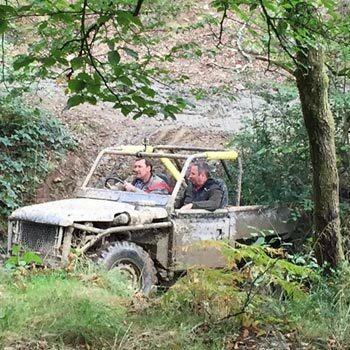 These Off Road Experience Days need real skill, determination and nerves of steel. Off Road Driving Experience Day. 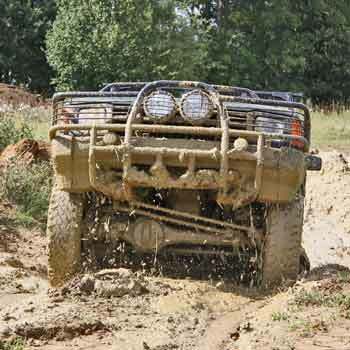 Off Road or 4X4 Driving is so exciting. You are in a powerful vehicle but you are in extremely challenging terrain, can you get through it? This is where you need nerves of steel, lots of skill and a bit of luck! After your training, your new skills will be tested to the limit driving up steep climbs and down crazy descents with mud, grass and water making everything that bit more difficult but so rewarding. Your heart will be thumping and your adrenaline will be pumping as you negotiate a course that looks impossible to complete. Learn new skills whilst enjoying yourself. You never know when your training and Off Road Driving Experience Day will come in useful. One of the best, if not the best, all round 4x4 vehicles ever produced is the Land Rover Discovery. It dates back to 1989 and is a front engined, four-wheel drive, mid-sized SUV. It comes in three or five door versions and with four speed automatic or five speed manual gearboxes. It has won many awards including "What Car" Car of the Year in 2005 and Motor Trends Sports Utility of the Year in 2005. Many of the top brands now have off road vehicles as part of their range including Audi with its Q3 and BMW with the exciting X3 machine. Swedish giant Volvo has also entered the fray with their 4x4 vehicle, the XC60. There are really too many great cars to mention but whatever you get to drive I am sure you will have a great day out. There is a huge range to choose from. Great value is the Basic 4X4 Driving Experience, take a friend along for an Off Road Taster Driving for Two Gift Pack or go for a full day Off Road Driving Experience Package with Lunch. All in all a great gift from Greatest Gifts.